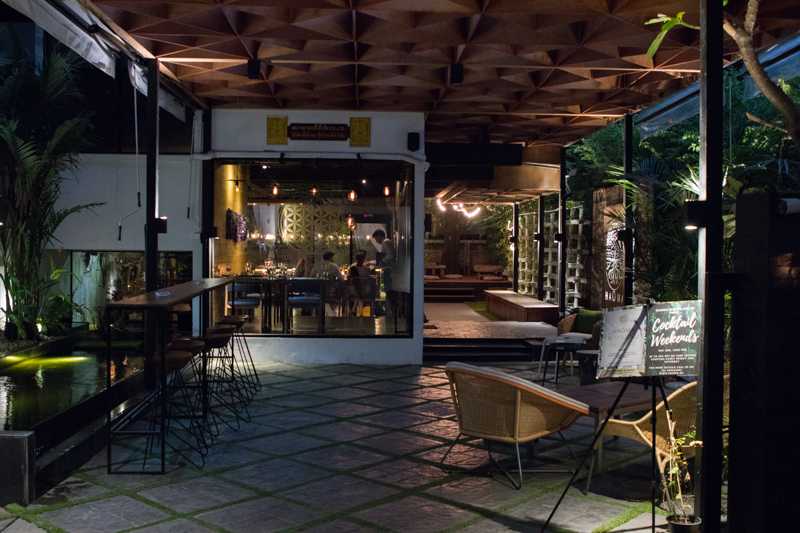 Not many restaurants in the world aim to be as carbon neutral as much as Haoma in Bangkok, Thailand does. 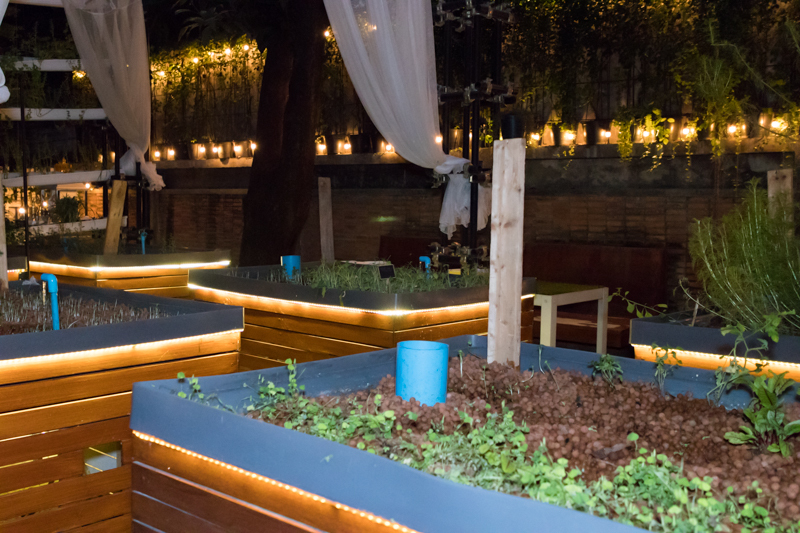 Named after the elixir of life, Haoma has managed to build an entire eco-system in its backyard, complete with rainwater harvesting, a farm full of vegetables and herbs as well as sustainable fishes. The whole process is self-sustaining as the waste from the uneaten food goes into feeding the fishes and the unwanted products from the fishes go into fertilising the plants and the cycle repeats itself. 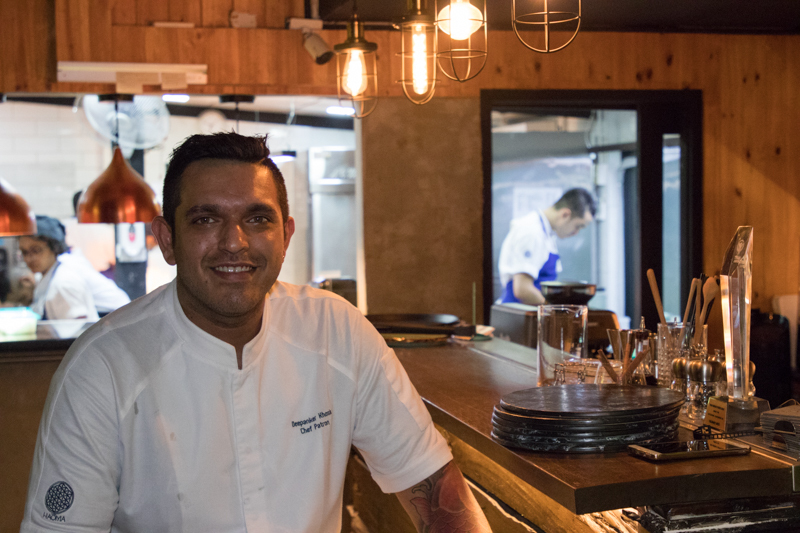 The restaurant is headed by Chef Deepanker Khosla (DK) who has been named Most Innovative Young Chef of 2018 by Elite Magazine as well as being a former Executive Chef at Frasers Hotel. 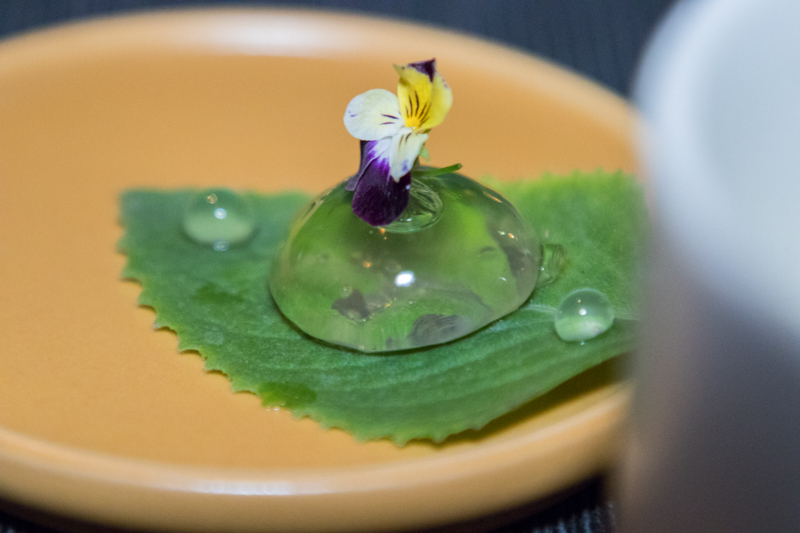 We went for the 9–Course Nature Menu (THB 1990 per pax) which has been carefully crafted by Chef DK with a unique ingredient selected from every city in Thailand. 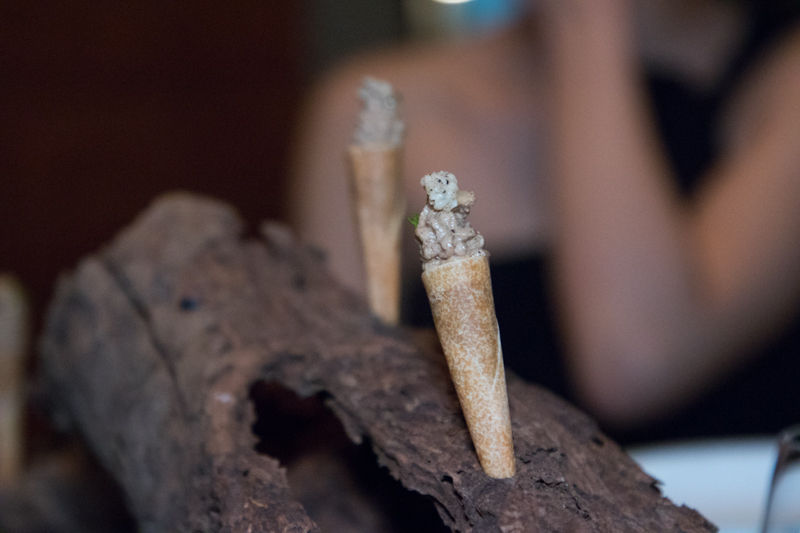 We started off our meal with Galauti Cornets served on a block of wood. After popping it into my mouth, I tasted an explosion of flavours from the 21 spices packed into such a tiny cone. It started off with a woodiness from the buttery cream on top, followed by a tinge of spiciness and the aromatic flavours of the newly-discovered Thai truffle. In the end, I tasted a sour punch from the citrus gel which rounds off the smokey and earthy flavours. 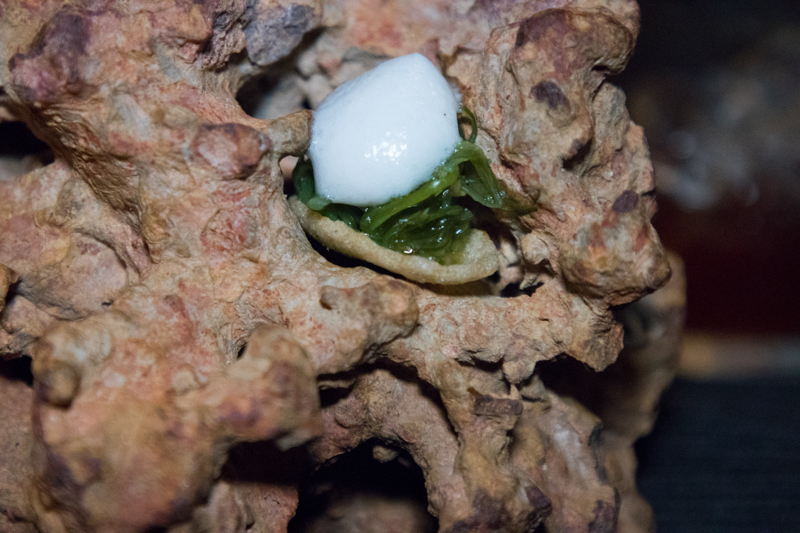 I really enjoyed this dish as I was pleasantly taken aback by the layer of flavours this small cone provided. It sure was a powerful way to start the meal. 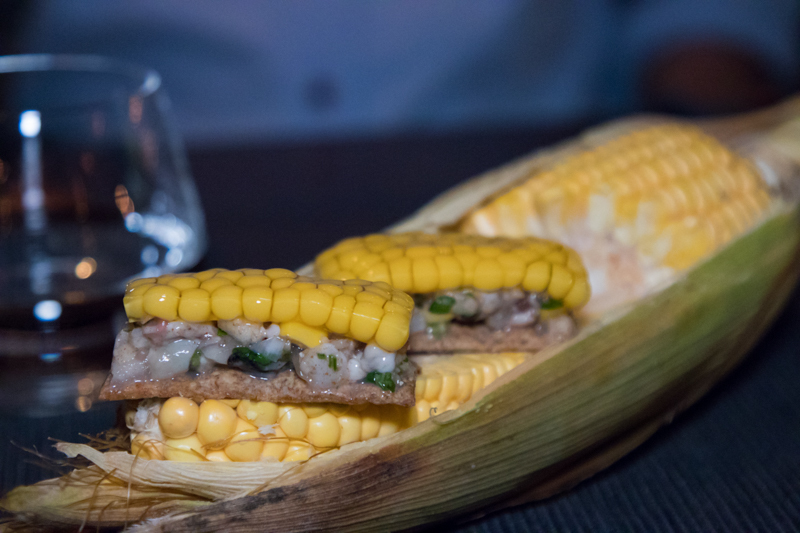 Secondly, we had the Oyster & Corn Tartar which looked like a slab that’d been cut out from a whole corn. 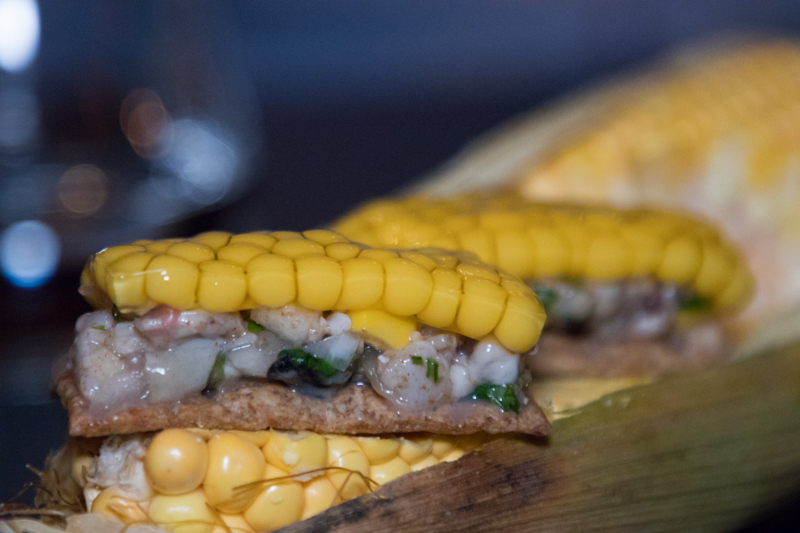 We later found out from the chef that the top layer of the tartar sandwich is a spherification of corn juice made to emulate corn. The spherification intensifies the sweetness of the corn which is a delightful contrast to the saltiness of the oyster. 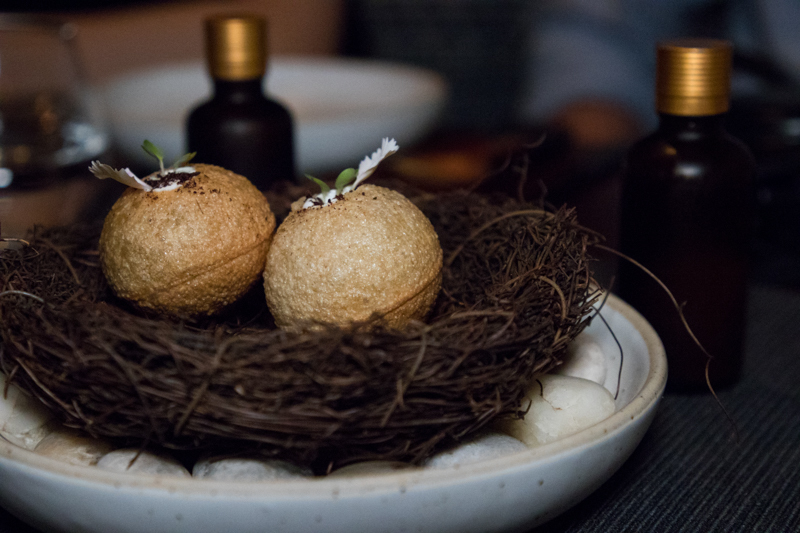 The oyster tartar is creamy and is layered on top of a brioche crunch which provides a crunchy texture. I found this dish extremely intriguing and impressed by the amount of effort that had gone into making a bite-sized taste of the sea. 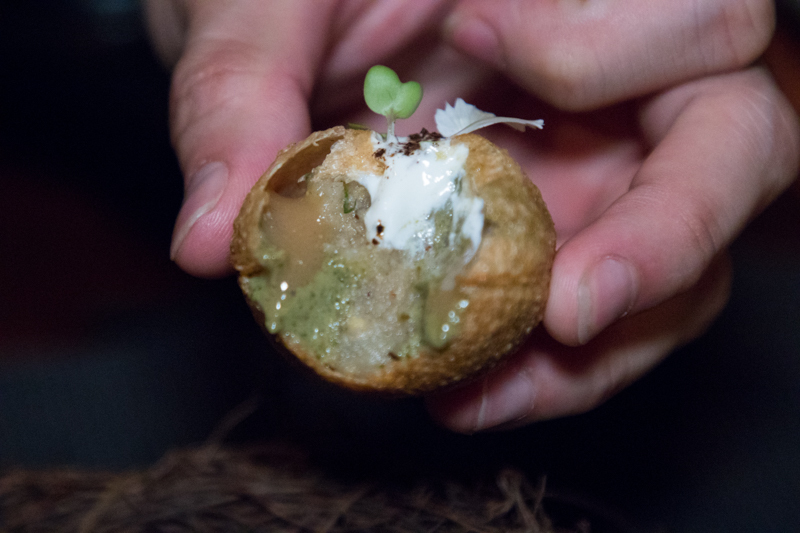 Thirdly we had a Golgappa, a whole wheat crisp stuff with chickpeas and potatoes. The crunchy crust held a creamy centre which tasted like a spicy whipped potato. We were also given a small bottle of yoghurt drink which helped to soothe the spiciness. I did not quite enjoy it as the shot of yoghurt drink had a pungent smell and would much rather have had the crisp ball by itself. The next dish, a Tomato Mist, is a cold dish which complemented the previous dish as it further helped to reduce the spiciness in my mouth. On top of the lid was a clear mist ball which emulated the mist on the borage leaves that’s grown in Haoma’s farm. Below that was a clear cold tomato broth with a green celery sorbet. 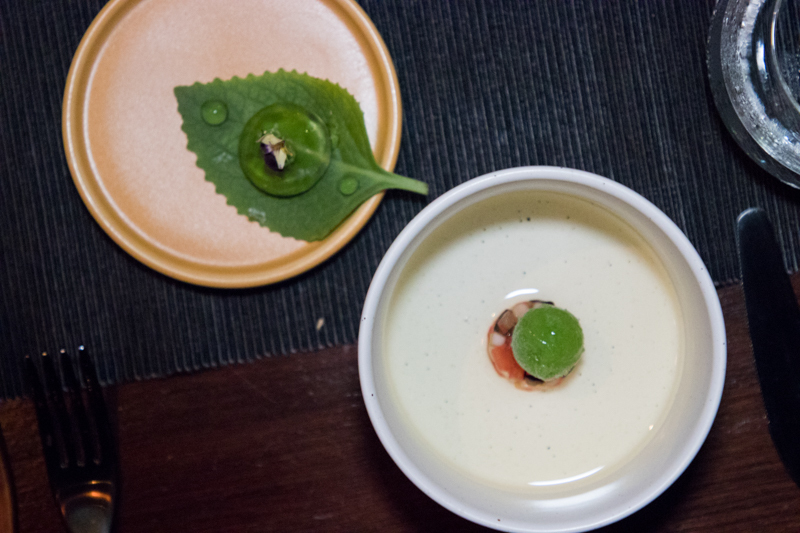 The celery sorbet gave the sweet tomato broth a leafy and earthy taste which I found very refreshing. 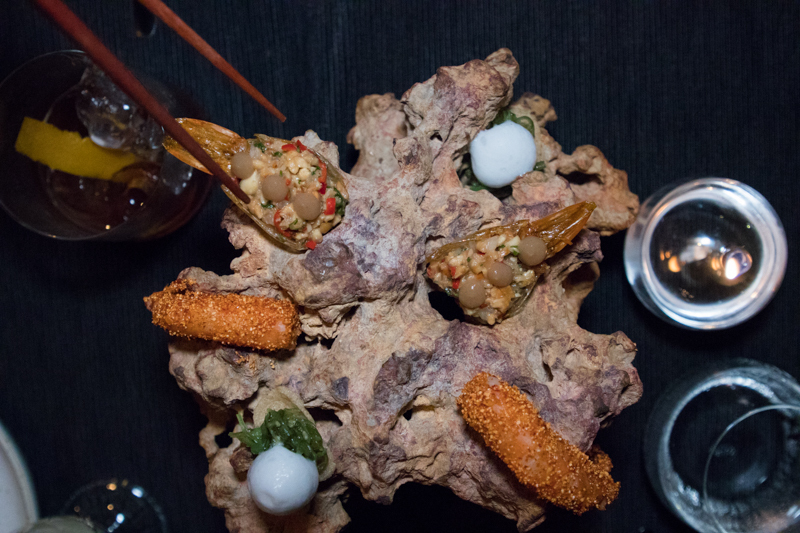 The dish also helped to cleanse my palate in preparation for the next dish, Prawn On Rocks. It is basically prawns done three ways and was set atop of a rock that these prawns typically would lay their eggs in. 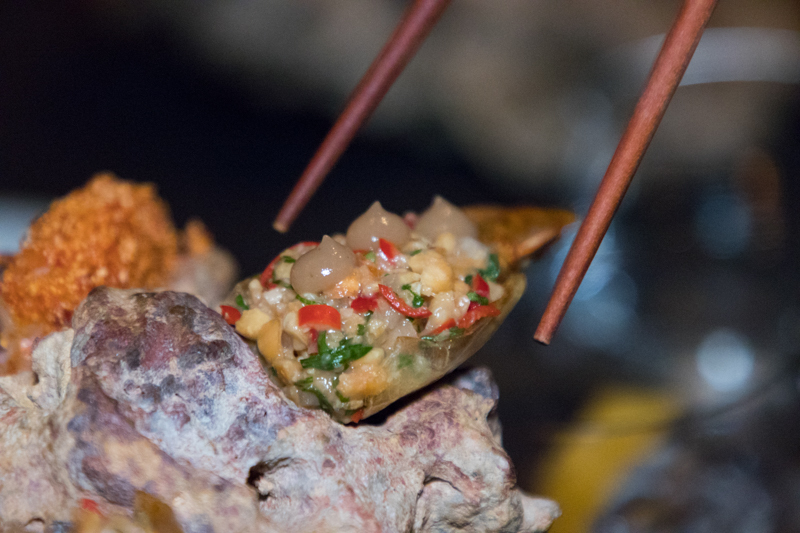 First was a crunchy prawn head with a creamy inside, that carried with it nutty flavours and had a slight saltiness. Next was light foam with seaweed and prawn roe. It was sweet and citrusy with an airy foam and a crunchy seaweed which drew similarities to yusheng. The seaweed provided a slight crunch in the mouth while the foam had a creamy initial taste. 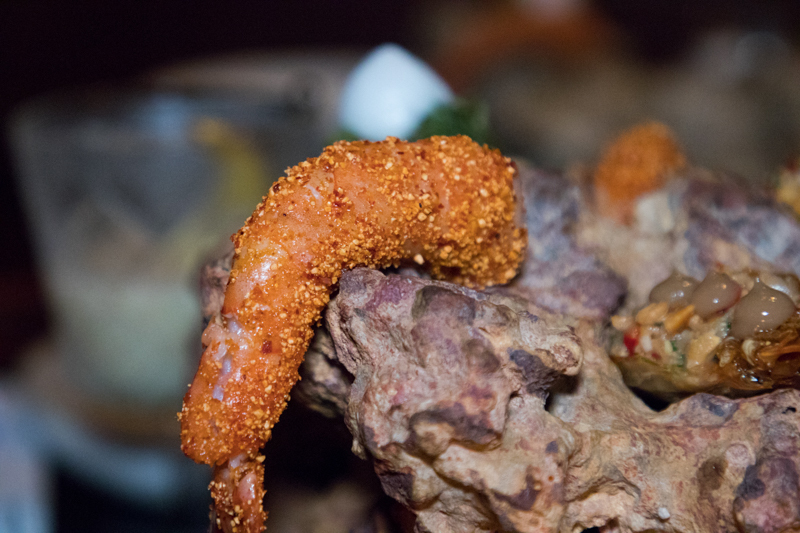 Thirdly it was the body of the prawn, coated in tom yum bits and deep fried. The prawn was extremely succulent and sweet with the tom yum adding a spicy zing to it. I really liked seeing the Chef make full use of every part of the prawn especially the head of the prawn. Being the part that I would always throw out, the Chef made it into a crisp chip that was loaded with the richn flavours of the prawns. 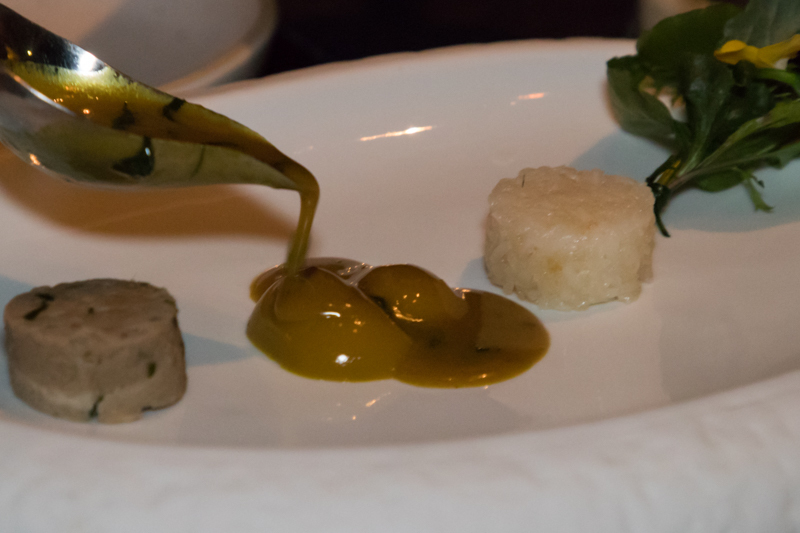 The next dish we had was called The Disappearing Duck; a duck mousse that disappears when a sweet curry is poured over it. We were advised to mix the sticky rice together with the curry and duck. It gave me a very homely feel almost like the kind of curry rice my mum used to make. The curry was not too spicy and the sweetness helped to mask the slightly gamey duck. Some edible leaves from the backyard were also placed on the side. They contrasted the curry with its mellow earthiness and elevated the sweetness of the duck. It would have a perfect dish if not for the rice which I felt was too hard and sticky, making it difficult to mix it with the rest of the ingredients. With so many intense flavours in my mouth, the next was more refreshing. 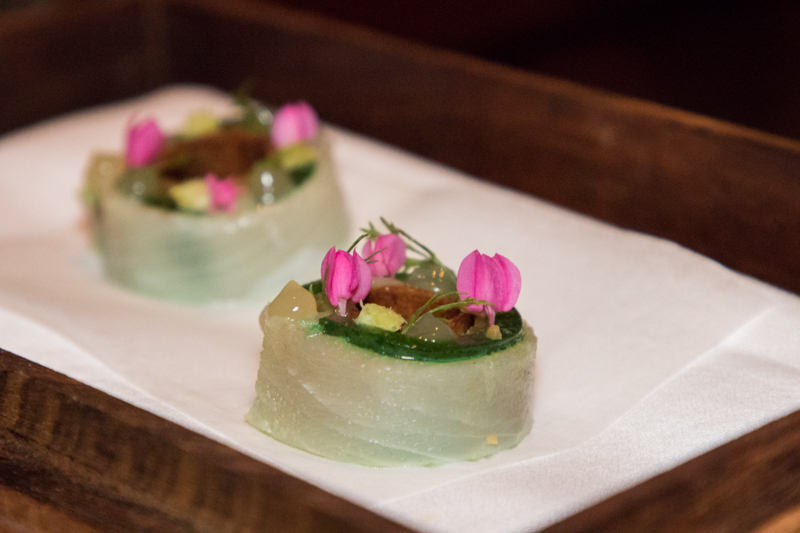 The Haoma In A Bite was layers of herbs with a Haoma-raised fish wrapped around it. Overall, I felt that in essence, it was very fishy and leafy. Furthermore, I could not taste the sweetness of the fish at all which was quite disappointing for me. 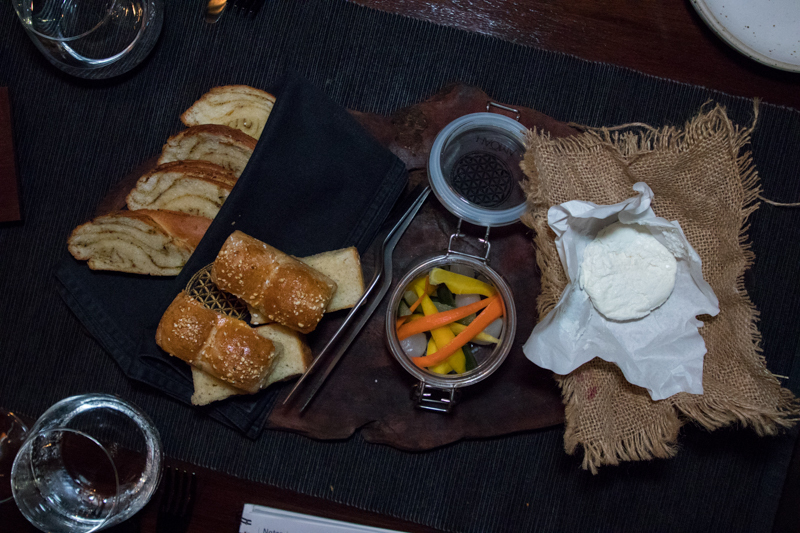 Next up was Burrata Brie and it was more of a transition to dessert, something to cleanse the palate. Warm toasted bread paired with different home-whipped butter and pickles. The pickles give the bread a kick of saltiness and an underlying sourness. 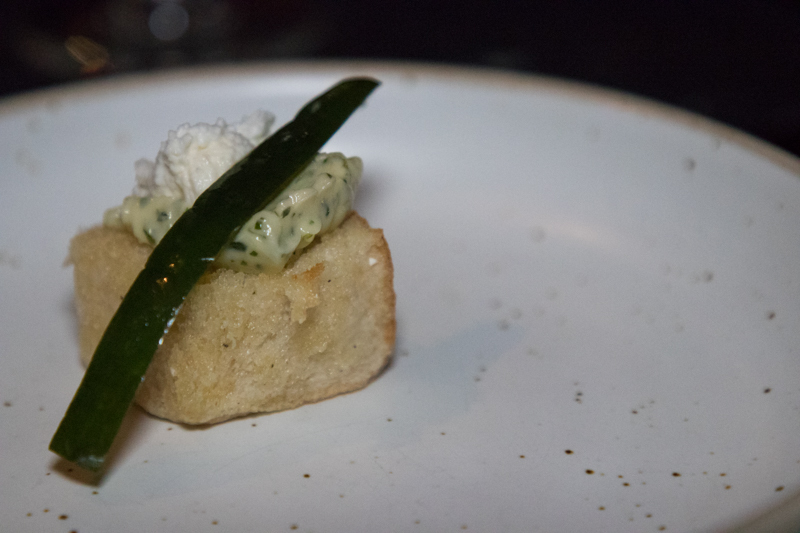 I really liked this dish as it was light and refreshing, which helped prepare me for dessert. Named after his wife, Nadia, the Chef put together all her favourite things in a dessert for us. There were components of sparkling wine, white chocolate and berries. The entire dish was light and fruity with a tartness coming from the berries. 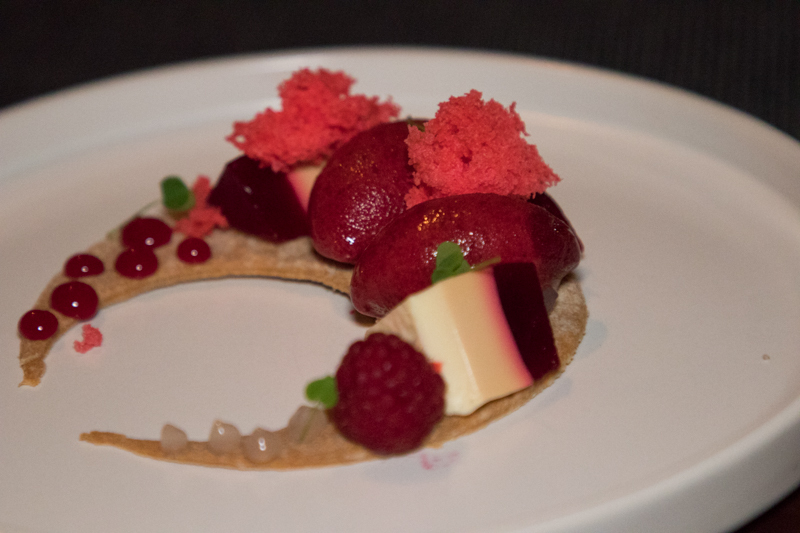 I liked the different textures in the dish, from the brittle chocolate to the ice cold smooth sorbet to the crunchy berries, ending the memorable course on a high note. All in all, I enjoyed the nine-course meal which was intricately put together. 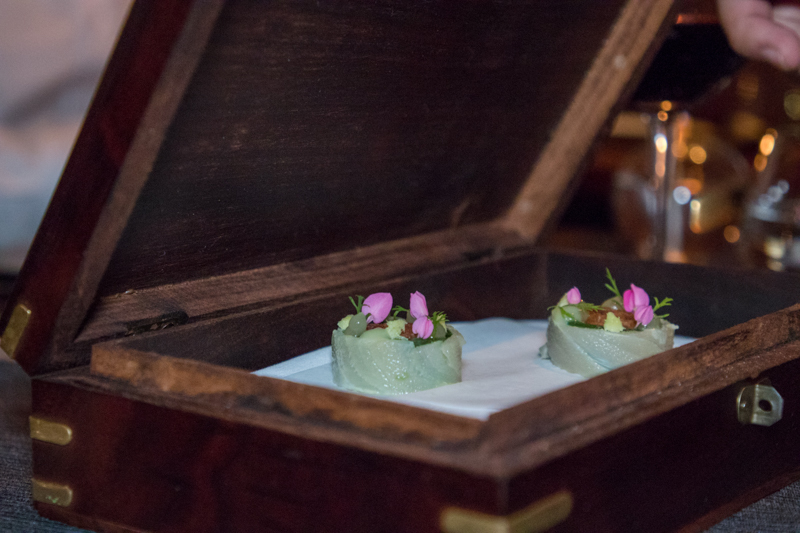 Each dish was carefully thought out and packed complex flavours into one tiny bite. However, I felt that the courses were not filling. Therefore I would recommend going for the 13-Course Set Menu (THB 2590 per pax) which features a Tikka Masala and Wagyu Short Ribs. 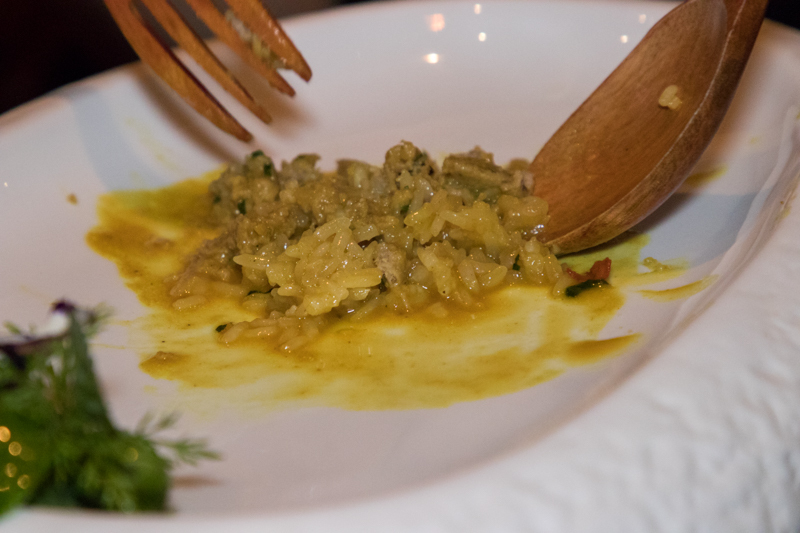 In addition, due to the chef’s Indian roots, each dish is packed with lots of spices. 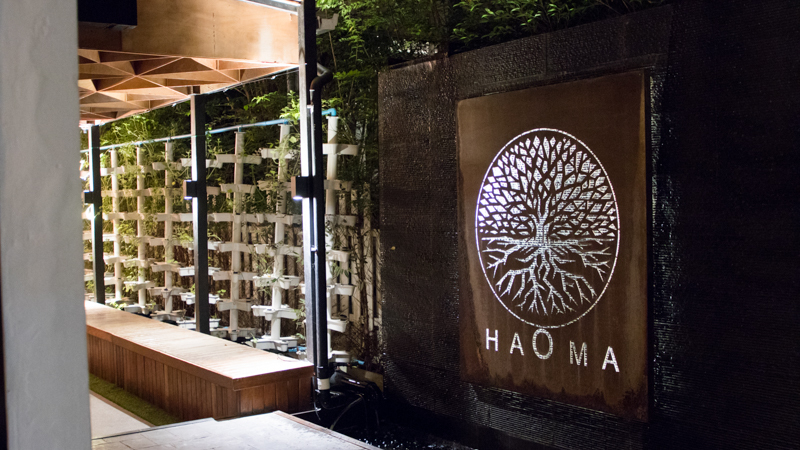 Haoma is what I feel like the next generation of restaurants are going to be — self-sustaining and putting a strong emphasis on being carbon neutral. 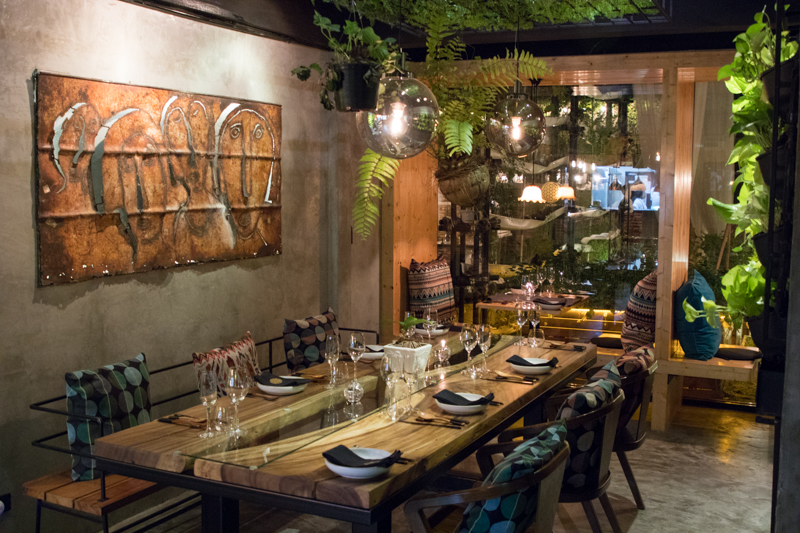 So if you would like to get closer to nature and see what an award-winning chef has for you, then do make your reservations now because they only take in up to 40 people a night.